Picked up a sweet little Halloween crab yesterday. He's very shy and hasn't even tried to pinch me. Currently he's in a small tank with coir sub, cork bark and moss, a dish of fresh water and a smaller dish of salt water. I'll be hooking him up with a chunk of cuttlebone today, and I've been feeding him bits of strawberry and fish food flakes. He'll be getting some mango and veggies tonight once I swing by the store. His current tank is pretty small (so is the crab so it's suitable for now), but I'm gonna be moving my desert beetles into a different tank, and he'll be getting their 20-gallon long, with deeper sub and more room to roam. 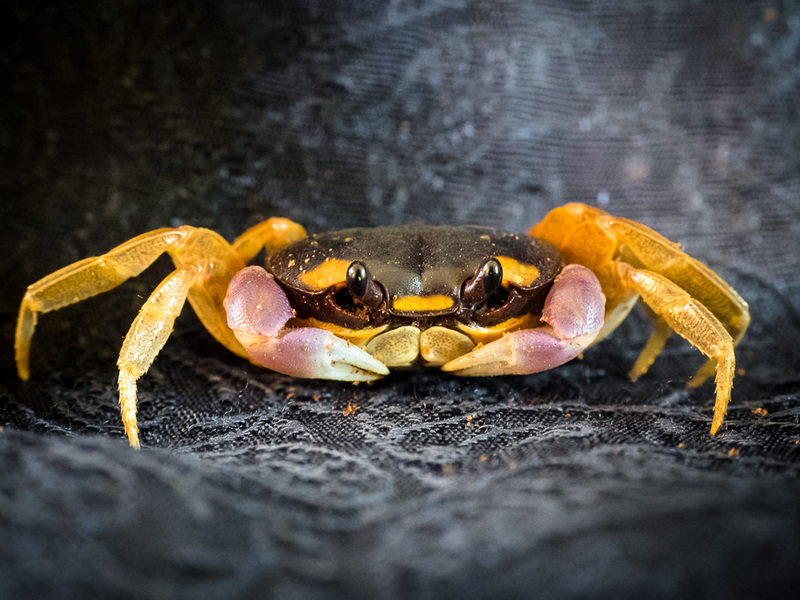 Does anyone have any care tips for Halloween crabs? I have a pretty good idea what I'm doing, I think, but advice from anyone who has successfully kept them would be appreciated. His name is Jack Shellington, because Nightmare Before Christmas is awesome. I've got no advice or experience, but he sure is pretty!